2012 ( GB-CA-SE ) · English · Drama, Terror, Thriller · PG-13 · 95 minutes of full movie HD video (uncut). 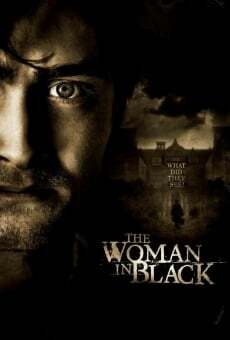 You can watch The Woman in Black, full movie on FULLTV - In London, the lawyer Arthur Kipps mourns the death of his beloved wife. Your employer assigns to travel to a remote village to examine the records of Eel Marsh House, belonging to the late Mrs. Drablow. On the train Arthur Daily befriends and man about an inn, where Arthur was poorly received, and was advised to return to London. However, Arthur goes to the mansion to discover it's haunted by the vengeful ghost of a woman dressed in black. You are able to watch The Woman in Black online, download or rent it as well on video-on-demand services (Netflix Movie List, HBO Now Stream, Amazon Prime), pay-TV or movie theaters with original audio in English. This film has been premiered in theaters in 2012 (Movies 2012). The official release in theaters may differ from the year of production. Film directed by James Watkins. Produced by Xavier Marchand, Tobin Armbrust, Simon Oakes, Roy Lee, Vic David, Richard Jackson, Guy East, Nigel Sinclair, Paul Ritchie, Neil Dunn, Ben Holden, Brian Oliver, Jonathan Hood, Tyler Thompson, Marc Schipper and Todd Thompson. Screenplay written by Jane Goldman and Susan Hill. Soundtrack composed by Marco Beltrami. Commercially distributed this film: Audio Visual Enterprises, Momentum Pictures, Shaw Organisation, Kinepolis Film Distribution (KFD), Svensk Filmindustri (SF), Dutch FilmWorks (DFW), Videocine S.A. de C.V., Alliance Films, Paris Filmes, Audio Visual Entertainment, Budapest Film, Diamond Films, KT&G Sangsangmandang, Metropolitan Filmexport, Nu Metro Cinemas, Svensk Filmindustri, Roadshow Film Distributors, Ascot Elite Entertainment Group, Empire, Broadmedia Studios, Aurum Producciones, Concorde Filmverleih, Videa, CBS Films and Sam Film. Film produced and / or financed by Filmgate Films, UK Film Council, Hammer Film Productions, Cross Creek Pictures, Hammer Films, Alliance Films, Film i Väst, Filmgate, Exclusive Media Group and Talisman Productions. As usual, the director filmed the scenes of this film in HD video (High Definition or 4K) with Dolby Digital audio. Without commercial breaks, the full movie The Woman in Black has a duration of 95 minutes. Possibly, its official trailer stream is on the Internet. You can watch this full movie free with English subtitles on movie TV channels, renting the DVD or with VoD services (Video On Demand player, Hulu) and PPV (Pay Per View, Movie List on Netflix, Amazon Video). Full Movies / Online Movies / The Woman in Black - To enjoy online movies you need a TV with Internet or LED / LCD TVs with DVD or BluRay Player. The full movies are not available for free streaming.